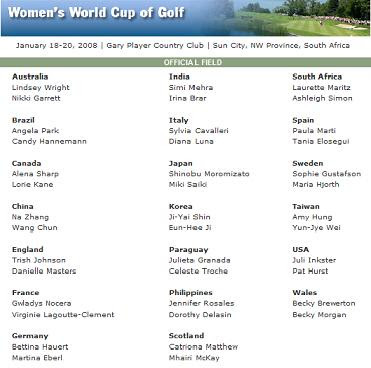 The Women’s World Cup of Golf is a 54-hole tournament with twosomes from 20 countries competing in a different format each day: foursomes, four-ball and stroke play. My favourite is always the foursomes (AKA “alternate shot”). I love it when a golfer is “stuck” with whatever her partner did before. It looks to be the most challenging for the players, especially if they don’t play the same type of game or even the same type of ball. And what high handicapper doesn’t love to watch a professional golfer sweat a bit. According the The Washington Post, three countries share the lead at women’s World Cup of Golf today (France, South Korea and Canada are tied for the lead midway through the opening day). Yeah Canada – You go girls! The defending champions, Julieta Granada and Celeste Troche from Paraguay are not likely to draw too much attention this year unless Julieta shows the promise she had in 2006 when she won the ADT Championship and became Rookie of the Year. 2007 was not a good year for either player, and I doubt they’ll even make the top 10 at this year’s event. Sorry ladies. The two teams that will most likely battle it out for the win will be Swedish Solheim Cup veterans Sophie Gustafson and Maria Hjorth (who will be trying to redeem Sweden from its 18th place finish last year), and Juli Inkster and Pat Hurst from the US, who placed 2nd last year after a strong showing in the foursomes. It really could go either way, but if Solheim Cup standings are any indication, I believe Juli and Pat with 14-8-5 and 10-7-5 records respectively have it over Sophie (8-9-6) and Maria (3-6-3) by a small margin. But that’s the great thing about golf – you just don’t know what will happen.